Set off west, along the road which should be signed to Wray and Lowgill. After ¼ mile, the road forks. Take the right-hand road (Whitepits Lane) and follow it for a little over ½ mile, until you reach the second track junction on the right, with Fleet House signs. Follow the track, crossing two cattle grids before reaching Fleet House. 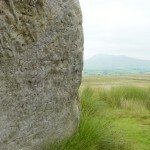 Go past the house, then climb a stile immediately to the left of the garage. Now turn left and follow the fence on your left initially, then head down the middle of the field, through a rushy marsh at the bottom, before crossing County Beck (into Yorkshire). 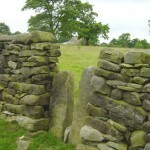 The field tapers to a point and leads between walls to a wooden gate leading onto the moorland of Bents. Turn left and follow the wall on your left along the edge of the moorland, until you are approaching its corner, then bear right to a wooden gate just before two cottages (which are partly hidden in trees). 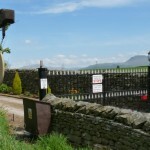 Go through the gate and follow the access track past the cottages, then across County Beck (into Lancashire) and a cattle grid. Immediately after the cattle grid, turn sharp right to a waymarked gate. Go through, then diverge slightly from the beck to a gateway in a wall, then return to the beck and follow it downhill to a gate at the bottom. Go through, then keep ahead a short distance to a farm track. 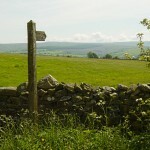 Turn right (crossing into Yorkshire again) and follow the track until you reach a T-junction after a cattle grid. Turn left and follow the track down to a surfaced road, Mewith Lane. Turn right, and at the next junction, keep straight ahead, passing Belle Vue farm on your left, for nearly 300 yards. Just after a footpath sign on the left pointing down a track to Nodogs farm, you will reach a footpath sign on the right; turn right here and go through a gate into a field. Go straight ahead to reach a squeeze stile in the wall ahead, then head straight up the next field towards a house (Flannagill) on the skyline. When you get there, keep to the right of the garden wall and follow it up to a wall corner. Climb the stone stile on the left, into the garden, then immediately turn right and cross another stone stile, back onto Bents moorland. 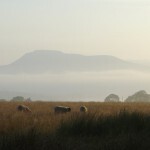 You should see two paths leading away across the moorland. Follow the left-hand path, parallel with the moorland edge and a phone line on your left, until you come level with a house (Old Field) on your left. After this, bear left towards a wall and you will come onto an access track. Turn right and follow the track, and at a T-junction, turn right. Follow this track for 70 yards, until you reach a waymark post on the left, just before a wall corner. 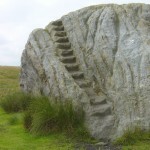 Turn left and follow the waymark, along an intermittent, rushy and marshy path, with the wall on your right, until you reach a track leading to Fourstones House on the right; the house is in Lancashire, and its converted barns are in Yorkshire! Continue with the wall on your right to a second track, and go across it (aiming straight for the Big Stone, which will have been in sight for some time) along a small path. 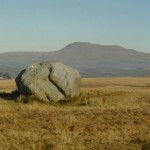 This winds uphill to the stone, officially known as the Great Stone of Fourstones. From the stone, follow the main access path left and downhill to a lay-by, where some interpretation boards give information about the stone and the views. Turn right and walk up the road, crossing the county boundary for the fourth and last time, to return to your starting point. 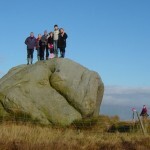 We hope you’ll enjoy walking this route. We’d like to keep these directions accurate and up-to-date, so please let us know if they need correcting, updating or clarifying. Thank you!